CAMPHORACEOUS - eg. eucalyptus, rosemary, peppermint, tea tree. CITRUS - eg. bergamot, grapefruit, lemon, lime, orange. FLORAL - eg. geranium, Jasmine, chamomile(Roman), rose otto, lavender, ylang ylang, neroli. HERBACEOUS - eg. chamomile, lavender, peppermint, rosemary, clary sage. RESINOUS - eg. frankincense, myrrh, galbanum. SPICY - eg. coriander, black pepper, ginger, cardamom. WOODY - eg. cedarwood, sandalwood, juniper, cypress.Earthy - eg. patchouli. aromomatherapy oils come from plants, they have a repuation for being harmless because of this and they are harmless, providing they are used correctly. think about it this way, asprin comes from the Willow tree and you wouldn't use that incorrectly would you? here are the safety points of useing the oils at home and without the advice of a qualified aromatherapist. 12 drops Peppermint Oil (headache/Migraine) Peppermint is also very helpful for nausea. Cover top with finger and shake. Check the fragrance of the oil. If it is unpleasant to you, add a few drops of whichever oil you prefer to make it more pleasant. Fill any remaining space in bottle with Sweet Almond Oil, insert the roller ball, and cap the bottle. Fill bottle approximately 2/3 with Sweet Almond Oil (For this one, I use a small glass bottle with an orifice reducer and a plastic insert for the opening that allows the oils to come out a drop at a time. If you don't like the fragrance of Jasmine, substitute an amount of Mandarin oil to achieve a pleasant fragrance, then fill the rest of the way with Almond Oil. Insert orifice reducer into top of bottle, then cap. To use: Variety of uses. Sprinkle a few drops on your pillow, massage your temples, etc. 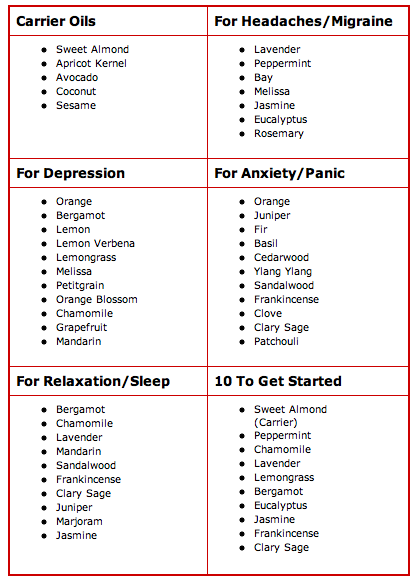 The below blends can help during times of anxiety. When selecting and using oils, be sure to follow all safety precautions and remember that aromatherapy should not be used as a substitute for proper medical treatment. Multiply your blend by 4 to obtain a total of 20 drops of your chosen blend. Add your oils to a dark colored glass bottle and mix well by rollling the bottle in between your hands. Add the appropriate number of drops from your created blend to your diffuser by following the manufacturer’s instructions. Multiply your blend by 3 to obtain a total of 15 drops of your chosen blend. Continue by using the 15 drop blend in the Bath Oil recipe. Continue by using the 5 drop blend in the Bath Salts recipe. Multiply your blend by 2 to obtain a total of 10 drops of your chosen blend. Continue by using the 10 drop blend in the Massage Oil recipe. The below blends can help enhance happiness, joy and peace. Citrus oils are a wonderful choice when seeking a pleasant, happy environment, and they are inexpensive. When selecting and using oils, be sure to follow all safety precautions and remember that aromatherapy should not be used as a substitute for proper medical treatment. The below blends can help during times of stress. When selecting and using oils, be sure to follow all safety precautions and remember that aromatherapy should not be used as a substitute for proper medical treatment. Directions: Blend the oils together and store in an amber or cobalt glass bottle. Do not use all 2 ounces of bath oil in one bath. After you have drawn your bathwater, add about 1/4 ounce (7-8ml) of the bath oil blend to your bath water. If you intend to use this bath oil with children, ensure that the oils that you have selected are safe for administration to children and use a smaller amount of the blend in the child's bathwater. Mix well to ensure that the blend has dispersed well in the tub and hop on in. It's best to add the bath oil just before getting in the tub instead of while the water is running so that the oils don't evaporate before you get into the tub. Using this bath oil blend is safer than adding pure EOs directly to the bath water. This is because the EOs can settle in one spot on your skin and cause irritation. 3 cups Dead Sea salt, regular sea salt or Epsom salt, or a blend of two or three of these salts. Sea salts typically come in several grain sizes. Combining multiple grain sizes can make your salts more appealing. Keep in mind, however, that more course grains do take longer to dissolve in the tub. 15-24 drops of your selected essential oil or essential oil blend. Be sure and take heed in the safety data for the oil(s) you choose to use. Place the salt mixture into a bowl. Add the drops of your chosen essential oils. Mix very well with a fork. Add the mixture to a pretty jar, salt tube, or container that has a tight fitting lid. After a day, you may wish to mix well again to ensure that the oils have blended very well. Add 1/2 - 1 cup of the salts to running bath water. Mix well to ensure that the salt has dispersed well in the tub before entering. To keep the essential oils from evaporating too quickly, you can add the bath salts just before getting in the tub instead of while the water is running. Sitting on undissolved chunky bath salts can be painful, so make sure the salts have dissolved well before entering. For the most natural bath salt recipe, leave your bath salts uncolored. Certain more exotic salts such as Hawaiian Red Sea salt (a lovely reddish/rust color) and Black Sea Pink salt (a soft pink color) have their own unique color and can be used. Directions: Blend the oils together and store in an amber or cobalt glass bottle. Apply during massage, being careful to avoid sensitive areas. 1.5 ounces of distilled water and 1.5 ounces of high-proof alcohol (vodka is suitable, rubbing alcohol is not) or 3 ounces of distilled water. Be sure and take heed in the safety data for the oil(s) you choose to use since an air freshener, by its nature, will come in contact with all those in your household. Directions: Fill the spray bottle with the choice of either 1.5 ounces of distilled water and 1.5 ounces of alcohol or 3 ounces of distilled water. (Even though a 4 oz. bottle is suggested, leave about 1 oz. unfilled so you can shake the bottle well between uses.) Then, add 30-40 drops of essential oil. Essential oils can very in strength. You may want to try 20 drops at first especially if you live in a household with someone who is sensitive to strong aromas. Shake the bottle prior to each use, and let it sit for about a day before making a conclusion that the aroma is too weak; the aroma can change after the air freshener has had time to sit. Mist lightly in the room. Be especially careful not to allow the air freshener mist fall onto furniture or into open beverages. Essential oils stimulates the powerful sense of smell. It is known that odors we smell have a significant impact on how we feel. In dealing with patients who have lost the sense of smell, doctors have found that a life without fragrance can lead to high incidence of psychiatric problems such as anxiety and depression. We have the capability to distinguish 10,000 different smells. It is believed that smells enter through cilia (the fine hairs lining the nose) to the limbic system, the part of the brain that controls our moods, emotions, memory and learning. Studies with brain wave frequency has shown that smelling lavender increases alpha waves in the back of the head, which are associated with relaxation. Fragrance of Jasmine increases beta waves in the front of the head, which are associated with a more alert state. Scientific studies have also shown that essential oils contain chemical components that can exert specific effects on the mind and body. Their chemistry is complex, but generally includes alcohols, esters, ketones, aldehydes, and terpenes. Each essential oil contains as much as 100 chemical components, which together exert a strong effect on the whole person. Depending on which component is predominating in an oil, the oils act differently. For example, some oils are relaxing, some soothes you down, some relieves your pain, etc. Then there are oils such as lemon and lavender, which adapt to what your body needs, and adapt to that situation. (These are called "adaptogenic"). The mechanism in which these essential oils act on us is not very well understood. What is understood is that they affect our mind and emotions. They leave no harmful residues. They enter into the body either by absorption or inhalation. When exposed to lavender oil fragrance (a relaxant), the keyboard typing errors dropped 20 percent. When exposed to jasmine (an uplifting fragrance), the errors dropped 33 percent. When exposed to lemon fragrance (a sharp, refreshing stimulant), the mistakes fell by a whopping 54 percent! Meditation awakens the intuition. When combined with aromatherapy, it becomes both an indulgent treat and a mini-vacation for an overworked mind. Essential oils work like a key to unlock our sensory system, triggering memories and emotions in the limbic system of the brain. When stimulated, the limbic system releases chemicals that affect our central nervous system, counteracting negative feelings such as anxiety, pain and negativity. Used to complement a meditative state, aromatherapy can help you to achieve a balanced, insightful frame of mind that will affect your mood in a very positive way. Patchouli, one of the most distinctively fragranced herbs, has a rich, exotic scent that is comforting and relaxing. It blends well with rosewood, which is a gently strengthening and relaxing oil." Lemon is also used in the blend. Its uplifting and cleansing properties can help to dispel mental fatigue and psychological heaviness. Studies have suggested that diffusing lemon oil throughout a busy office building can cut typing errors in half. The warm, penetrating energy of lemon is further complemented by the uplifting and rejuvenating qualities of jasmine essential oil. It's been documented that meditation can help the body to shake off stress and consequently boost the immune system. A state of deep relaxation can also create surprising flashes of inspiration and clarity by unscrambling thoughts. Try it when you are most worried about a problem -- emptying your head and relaxing your brain often creates the space for that brilliant idea to surface! Find a quiet place where you won't be disturbed. If you are at your desk, take your phone off the hook and turn off your computer. Place 5-6 drops of the Meditation blend in an Aura Cacia lamp ring or diffuser and allow the aroma to fill the atmosphere around you. Sit in a comfortable, upright position with your hands laid in your lap. Close your eyes and let your breathing slowly become natural and relaxed. Take a mental walk through a beautiful, sunny landscape. Feel the warmth and peace that surrounds you. Keep breathing in the clarifying aroma slowly and deeply. After 20 minutes, open your eyes and slowly come out of your Meditation. When you have become accustomed to meditating on a regular basis, you will find that you emerge feeling calm, centered and refreshed for the tasks that lie ahead. Essential oils can be used in many ways to induce a state of relaxed clarity. (They are very concentrated, so always dilute them in a good carrier oil such as Grapeseed Oil, Apricot Kernel Oil and Sweet Almond Oil before applying to the skin). For a contemplative soak, slip a Meditation mineral bath into warm water and relax for twenty minutes by candlelight. Alternatively, add 3-4 drops of the single essential oil blend to a handkerchief and inhale the aroma at intervals while relaxing your breathing. Lamp rings, available in ceramic or brass, provide an ideal way to diffuse your home or office with positive mental energy. This thread wouldn't be complete without me mentioning my favourite oil, Lavendar. lavendar is basically the band aid of aromatherapy, and can be used for so many things, from cuts and grazes to depression. when I smell lavendar it really does take me onto a different level. lavendar is very much back in vogue at the moment as it did go through a phase of seeming very old fashioned. known as the witches herb!! make sure you get a good quality oil, purchase lavendar 'high alpine' to ensure the best. I love lavendar, its gorgues to see it growing and to walk past peoples gardens when they have bushes of it out front! I voted for herbaceous and woody. I have been into aromatherapy since I was 13. I love the smell of lavender, cedar wood, rosemary, germanium, peppermint, eucalyptus, loads of em! I'll probably change my mind again in a few days but lavender will always be my favourite oil, so versatile! Lavender literally takes me onto another spiritual realm! All I can say is WOW WOW and Thank you so much for posting this amazing wealth of information, cant wait to digest it all!!! AngelM do you have anything to add to this imense article? oh my God.. this is amazing... I mean where did all of you come from??? Excellent info, Cauldron -- thanks so much! I like mint, ginger and wintergreen for muscle aches, although I don't recommend wintergreen for anyone who's using blood thinners, aspirin, or other anti-inflammatory herbs. Even though it's applied externally, it can add to the blood thinning effects of herbs and medications that are taken internally. I'm a little surprised that Rosemary didn't make the list of essential oils that should not be used without the supervision of a knowledgeable practitioner -- just a few drops can raise the blood pressure, and it's a common enough reaction with Rosemary to warrant a warning, especially for folks who already have hypertension issues... imo. Drives me nuts when I go to a shop and they have essential oils out in 'tester' bottles with no dilution or warnings! I'll certainly be adding this thread to my list of resources when I need to look up info regarding essential oils! Thanks again! It's so comprehensive that I copied and pasted it into my Word Pad so I can have it offline (as I don't have direct access to the internet). I also have some good distributors/sellers of essential oils (all therapeutic quality - I wouldn't recommend them if I didn't feel they were good). Their prices are reasonable too. I don't buy much from the Nature's Gift - but they do have my Labdanum and some other 'oddball oils' that are kind of hard to find. Hope this info is of help.